Powdered Pigment Techniques eArticle Posted! 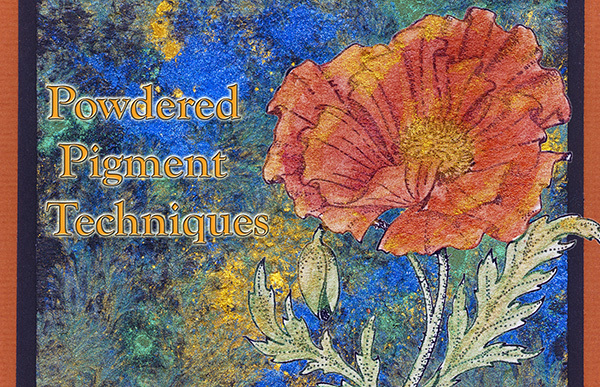 VSN’s newest eArticle, “Powdered Pigment Techniques For Stampers” has been now been posted. Do you have a jar of powdered pigments but don’t know what to do with it? You are in for a treat because there is so much possibility in that jar! Techniques in this eArticle include mixing with a binder, dry dusting, painting with dry pigments, two ways to use them with watermark ink, two ways to use them with embossing powder, mixing with water to make paint or spray, using with stamp inks or art mediums and using with wet or dry adhesives. 57 half-sized pages designed to view comfortably on your computer screen and is also printable! (pdf version. See below right.) Color photos of technique steps. 18 beautiful stamp art examples of the techniques covered. 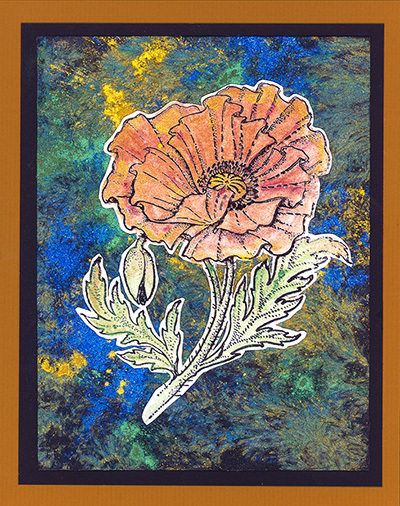 Here is another card from the upcoming “Powdered Pigment Techniques“ eArticle that will be posted this coming Thursday (6/20/13.) This one uses an Embossing Arts stamp, powdered pigments, glue, water and cardstock. I used one powdered pigments technique to color in the flower and another to create the background. Details coming in the eArticle. I hope you are having a lovely relaxing weekend and have had a chance to get your fingers a bit inky. This is a simple card I made last week using one of the techniques in the “Powdered Pigment Techniques“ eArticle that will be posted this coming Thursday (6/20/13.) In the scan, you can see the copper color of the card, but not the metallic shimmer of the mica powder. 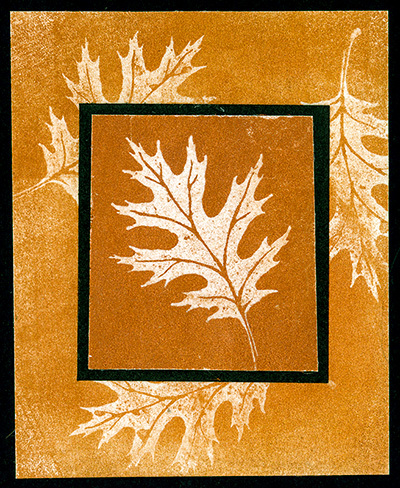 It uses a oak leaf stamp from PSX, Pearl Ex (Super Copper) and VersaMark ink on white and black cardstocks.